The new B&G WS310 and WS320 wired and wireless wind sensors usher in a new level of performance for wind sensors. Designed for cruising and club racing sailors, the vane design is an evolution of B&G’s existing sensors, developed through thousands of hours of testing to provide the best possible wind solution for sailing. After selection of the cup and vane sensor design as the most suitable for sailing, and with B&G already having the industry’s leading design, we were able to take each existing wind sensor component and iteratively improve its performance, making the best even better. But don’t just take our word for it – here’s how we tested them. We bought one of each wind sensor on the market, including our previous generation sensors, and subjected them to Wind Speed, Wind Angle and Heel tests in the Wind Tunnel at the University of Southampton. • A maximum tunnel speed test to test the robustness of each sensor in extreme conditions. This compares Wind Tunnel speed with the error in sensor speed output. A perfect result is a straight line along 0%, however it is normal to see a larger % error at low wind speeds because (e.g.) a 0.1 knot error is a 5% error at 2 knots, but only 1% at 10 knots. Several competitor products showed significant errors, with two in particular standing out as very poor [Golf and Romeo]. Charlie is an ultrasonic sensor and - as expected - performed very well in this upright, controlled test. WS320 shows a very consistent and accurate speed reading. This test compares the sensor wind angle output with a known wind tunnel air-flow angle, using a fixture to mount the sensors in a repeatable manner. A good result is a small error at each angle, shown as a smaller area on the chart (closer to the centre), with a consistent error being preferred to an erratic one. WS320 exhibits a significantly more accurate wind angle output than all other sensors, up to 10x more accurate than some sensors. A great test of a “sailing” wind sensor, this test compares the sensor wind angle output with a known wind tunnel air-flow angle while heeled - used to simulate normal sailing conditions. Errors here are caused by physically changing the angle when rotating the sensor in the air flow, so a good result is a small and consistent error across the wind speed range (at the same tunnel angle and heel angle), shown by a reasonably horizontal line on the chart. A bad result is a line with a steep gradient on the chart. This test highlights general weaknesses in mechanical design. The unusual design of one sensor [Golf] provided very poor performance in this test with high errors. WS320 shows good response to heel, with a consistent offset that may be corrected in calibration. How accurate is the sensor vs. the typical wind sensor? What is the maximum range of the wireless (WS320) sensor? Wireless range is a difficult specification to quantify in a real-life condition, as such we have been quite conservative with the range and advise use in applications requiring range up to 30m (100’). To make user selection easier we quote this as a mast height of up to 25m, based on a fairly typical system layout. How do I know the wireless connection is good on my installation? Within 30 seconds of power on you will see smoothly updating wind data with no gaps, but as a secondary check you can view Signal Strength % in the WS320 unit data in the Device List of a MFD – anything over 25% should provide reliable connection in a typical installation. How much sun is needed to charge the WS320? The unit is designed to charge on an overcast day, users will see positive charge during all normal daylight conditions. How long will the WS320 battery last without charge? If the unit is in constant use (with main system switched on) and in the unlikely event of no charging at all, it will continue to operate for over 2 weeks. How long is the overall lifetime of the WS320 battery? We expect the battery to require replacement after 3-5 years, depending on environment and use level. What should I do with my WS320 if I remove my mast over winter? It is recommended to unmount the unit and store it in a location where it will receive a few hours of daylight each day. If you decide to store the unit out of daylight it is recommended to disconnect the battery – you will need to reconnect the battery and place in daylight to ensure some charge before refitting the unit, you will also need to re-pair the unit with the base station before re-installation if the battery has been disconnected. Will my unit discharge overnight? Only slightly if you are sailing, and barely at all if you are in the marina with the main instrument system turned off – the wind sensor runs in a low power mode until the wireless interface on the system is powered on. The typical overnight power use is topped back up with an hour or two of daylight. Can I see the battery charge status of the WS320 sensor? If the WS320 is so good, why would I use the wired version (WS310)? Installations with mast heights of 25m+, installations on larger boat that may have significant 2.4GHz communications on board (Bluetooth, Wi-Fi) which may reduce operational range of the WS320, boats of carbon or metal construction where base station location may be obscured or a more straight-forward desire for a traditional wire! The unit is clearly very accurate, will B&G be replacing the Vertical MHU units with this sensor? Yes. Later in 2019 the Vertical Masthead Units (VMHU) will be replaced with units based on the WS310 (wired) mechanics and sensor hardware, test units are already in the field. Why did B&G select a cup and vane design rather than an ultrasonic design? Ultrasonic sensors have many advantages however in real-life sailing conditions they suffer from some disadvantages that make them unacceptable for our application (which includes steering the boat under autopilot safely) with several sailing angles (both wind angles and heel angles) where the physical design restrictions associated with ultrasonic sensors affect wind angle and wind speed measurement. Performance in certain weather conditions (heavy precipitation, fog or icing) is also uncertain without complicated and heavy design counter-measures. 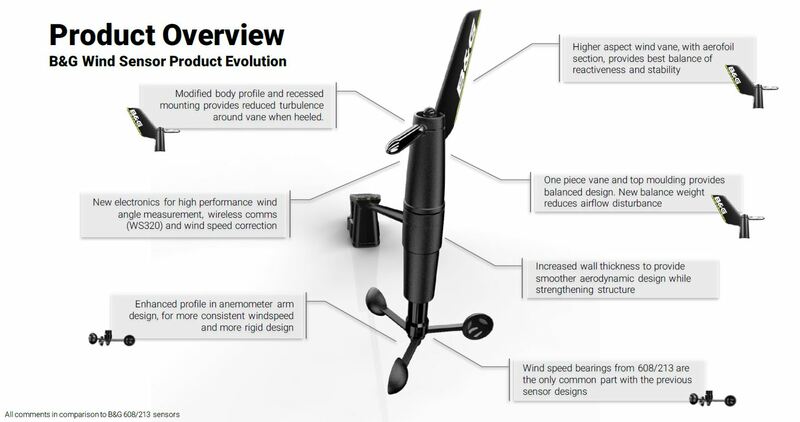 A high precision wired wind sensor, designed for cruising and club racing sailors. The B&G WS310 wind sensor pack offers high performance data accuracy, with improved aerodynamics suitable for all yachts. Includes all you need for installation.